sovereign land belonging to the Nation of Hawaii, on HAWAII FIVE-0, Friday, January 20 on CBS. Introducing Aloha Coin, the first and only crypto currency in the world with a national identity and land base, the national monetary system of the Nation of Hawaii. Explore the legal foundation for Hawaii's independence. Check out the latest news and alerts and sign up to our email list. which was filmed on location at Pu'uhonua o Waimanalo village. Here's a trailer with Bumpy in it. "Oh, honest Americans, as Christians hear me for my downtrodden people! Their form of government is as dear to them as yours is as precious to you. Quite warmly as you love your country, so they love theirs. With all your goodly possessions, covering a territory so immense that there yet remain parts unexplored, possessing islands that, although new at hand, had to be neutral ground in time of war, do not covet the little vineyard of Naboth's, so far from your shores, lest the punishment of Ahab fall upon you, if not in your day, in that of your children, for"be not deceived, God is not mocked." The people to whom your fathers told of the living God, and taught to call "Father," and now whom the sons now seek to despoil and destroy, are crying aloud to Him in their time of trouble; and He will keep His promise, and will listen to the voices of His Hawaiian children lamenting for their homes." "The United States is just - a land of liberty. The people there are the friends - the great friends of the weak. Let us tell them - let us show them that as they love their country and would suffer much before giving it up, so do we love our country, our Hawai'i, and pray that they do not take it from us." "What Would It Take To Achieve Hawaiian Sovereignty?" Daryl Huff moderates the discussion with Peter Apo, Lilikala Kameeleihiwa, Kaleikoa Kaeo, and Bumpy Kanahele. Leader in effort to build a Native Hawaiian nation calls dispute just a "blip"
'Bumpy' Kanahele has carved out an Oahu village where native values reign. Many see it as a steppingstone to the goal of sovereignty. to our news, update, and action alert mailing list. 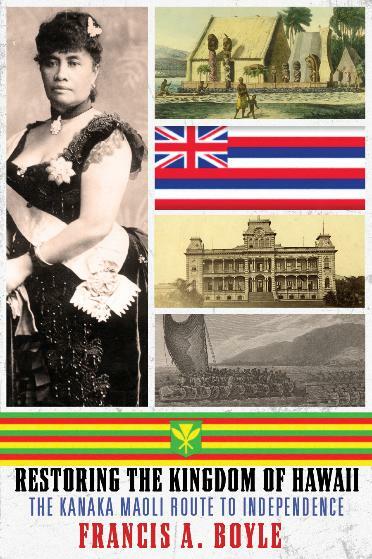 The links below provide highlights of current and past activities related to Hawaii's independence and history. They are collected from a variety of sources, in order to support education, awareness and action, with aloha. oppose the "Akaka Bill" and "federal recognition"
From Native Hawaiian to Native American? "Down in the shadowy realms where U.S. foreign policy shakes hands with the devil... the overthrow of a friendly monarchy."